The Broke Girl’s Guide To Yoga In S.F. Forking over big bucks at San Francisco’s top yoga studios to perfect your asana is so worthwhile. But, it becomes a big ol' problem when you don't have enough dough left over for a yogi-goddess wardrobe that lets you actually show off your practice. So, we're solving this conundrum, mapping out where to chaturanga with some of the city’s top instructors — on the cheap. Yep, as in free or small, optional donations. Studios, shops, and even churches (well, at least one gorgeous cathedral) across the city are offering yoga at prices that will shape you up, bliss you out, and leave enough cash in your crop-top fund to keep you feeling Zen and looking good all season long. Ahead, the classes that won't have you doing a balancing act with your bank account just to perfect your crane pose. Photo: Courtesy of Purusha In The Park. 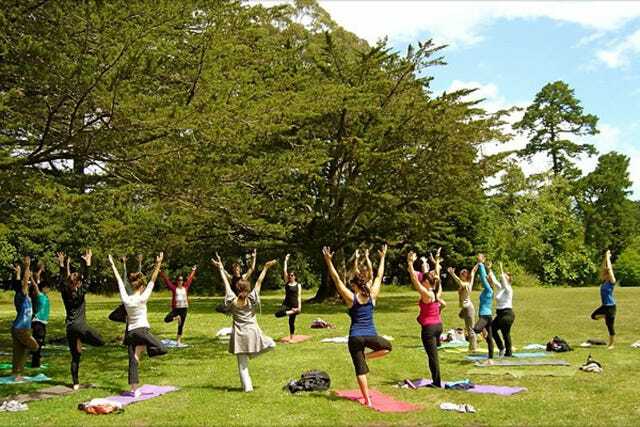 Purusha Studio’s senior instructors lead weekend hatha-style sessions in Golden Gate Park. (Dolores Park sessions will resume once the park reopens.) These Saturday and Sunday morning classes are all about holding traditional poses just long enough to feel the burn, but they leave out the vinyasa flow for a steady focus on mindfulness. Of course, an al fresco savasana may be lovely, but the best part is that any donation benefits the Purusha Seva project, an initiative to help underprivileged teenage girls through yoga and the arts. Iyengar yoga is the ballet of the yoga world, all classical technique and nuanced movements. A common saying among Iyengar pros is "Don’t move any faster than your attention span." To fine-tune the mechanics of any yoga practice, even those of the fiercest aerobics-style vinyasa flow, try hopping into one of Tony’s Iyengar-inspired alignment classes to dive deeply into a handful of poses that will refine your practice and experience how slowing it all down can feel so right. Price: Recommended donation of $8 to $10. If a slow, meditative flow to live music in stunning surroundings sounds like the dreamiest Tuesday night ever, you’re right. Check out Grace Cathedral’s Labyrinth yoga, accompanied by live tunes and in the hands-down-coolest, most unique yoga space in town. About as Zen as it gets, this nonjudgmental and beginner-friendly slow-flow hatha class is as welcoming to new yogis as it is for seasoned practitioners who don’t mind popping into arm balances at their own pace. Price: Recommended donation of $10. Satori Yoga offers a number of traditional hatha, vinyasa, and Iyengar classes. All are wonderful, but the best bang for your buck at Satori is its sweaty Friday night Mixed Level Flow class taught by Debbie Steingesser. Debbie is a former DJ, so her playlists are on point, and she often has musical friends stop by to accompany the class with live music. Oh, and did we mention that, after class, yogis are welcome to a complimentary wine and cheese reception? This is how to get the weekend started right. Price: Classes are $17, $12 for students, and mat rentals are complimentary. Free yoga with some of the city’s top instructors from studios such as Yoga Tree and Yoga Works? Done. Each Lululemon location in San Francisco offers its own complimentary yoga (or, occasionally, other fitness) class on a weekly basis, at either pre- or post-work hours to accommodate yogis with a 9-to-5. Either bring your own mat, or rent one from the shop at no charge. All levels are welcome, and rotating teachers each month ensure your weekly practice is always fresh and evolving. Photo: Courtesy of Yoga To The People. These classes are the go-to for an affordable, approachable, tush-kicking flow. All sessions are open-level and beginner-friendly, and instructors offer a consistently sweaty vinyasa-style class format to work that bod(dha konasana). These rooms are heated, so be prepared to sweat. And, a tip for YTTP first-timers? Get there at least five minutes early — a strict "no latecomers" rule is in effect. Laughing Lotus is famous for kick-starting the career of many famous yogis with its Lotus Flow training program. A midafternoon, donation-based class taught by "blossoming teachers" allows local yogis to discover the next generation of great Lotus Flow instructors fresh off their certification. The hour-and-15-minute-long class is a signature Laughing Lotus beginner series: just sweaty enough, with a nice flow and bit of reflection. A recommended donation benefits the Love Saves the Day program. Price: Recommended donation of $7 to $10. If a totally under-the-radar, hidden-gem yoga class by the Bay sounds like your kind of Sunday morning brunch pregame, then the Sports Basement community class is your new, favorite wake-up call. Held in one of the community rooms of the Marina’s sprawling Sports Basement, each Sunday morning session features a different teacher and different style of yoga. A slightly laid-back vibe means classes may not start exactly on time, but once they do, they're well worth the wait. All are multilevel and beginner-friendly. Just remember to bring your own mat. Lillian So’s Fitmob Yoga Fusion class is San Francisco’s newest brand of, erm, yoga fusion. Entitled SoFluid, the class mixes up the traditional vinyasa flow with surprising, dance-like transitions and a special attention to squats and cardio. Oh, and a little tai chi thrown in for good measure. Fascinating, right? The best part is taking more Fitmob classes each week reduces your weekly fees, making this a good deal and extra workout motivation. Mats are included. Price: $20 per week for two classes, $15 per week for three. Athleta must know its surrounding hood is filled with bendy yogis, because it's not afraid to host a challenging — though still beginner-friendly — weekly class of free, in-store yoga. Each month features a different, talented, and well-known teacher and mostly heart-pumping vinyasa-style flow classes. Be sure to check its online calendar to see who’s teaching and when, as this changes each month. Bring your own mat, or grab one on site at no charge.